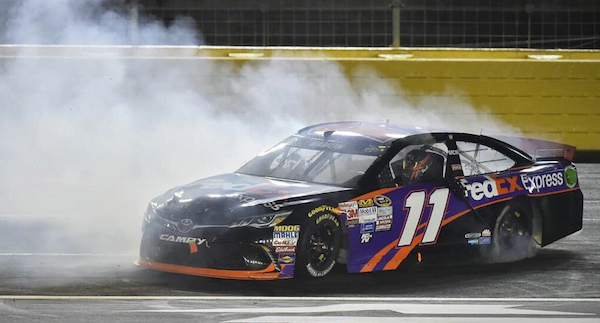 Pole sitter Denny Hamlin held off Team Chevy’s Kevin Harvick to give Joe Gibbs Racing their first ever NASCAR Sprint All-Star race win Saturday night. Hamlin ran strong in all four of the 25-lap segments, but after he had fallen back to sixth, his fast pit crew was able to get him back to the front of the grid. Based on average finishing order, Hamlin was sixth before the final mandatory pitstop ahead of the last 10-lap sprint segment. His pit crew, widely recognized as one of the best in NASCAR Sprint Cup competition, allowed him to exit pit road in first. Kurt Busch, Harvick and Kasey Kahne were directly behind Harvick on the restart, but couldn’t catch the No. 11 Toyota after Hamlin gained a significant lead. Harvick was the closest driver behind Hamlin as the final ten laps wore on, but he never got close enough to battle for the lead. At the end of the night, the huge $1 million paycheck went to Hamlin, and Toyota got their first-ever Sprint All Star Race win. Despite crossing the finish line in second, Harvick wasn’t too happy with the way the final 10-laps panned out, in part due to a mistake where he nearly lost control of the car was it drifted up towards the outside wall. Jeff Gordon’s final All-Star race saw him turn up fourth, while Toyota’s Matt Kenseth slotted in behind him in fifth. Kyle Busch ended up sixth in his first race back since being injured in a scary NASCAR Xfinity wreck earlier this year, but he was happy to use the points-free race as practice for next week’s Coca Cola 600.